B4410LF-SS is rated 3.8 out of 5 by 106. Rated 5 out of 5 by None from Easy to use My plumber installed it last week (April 11). I like the hand spray, cord is very flexible after initial use. Faucet is high enough above the sink to handle washing my tallest pot. Rated 4 out of 5 by Rick from Inexpensive,Stylish Easy to install.Inexpensive. 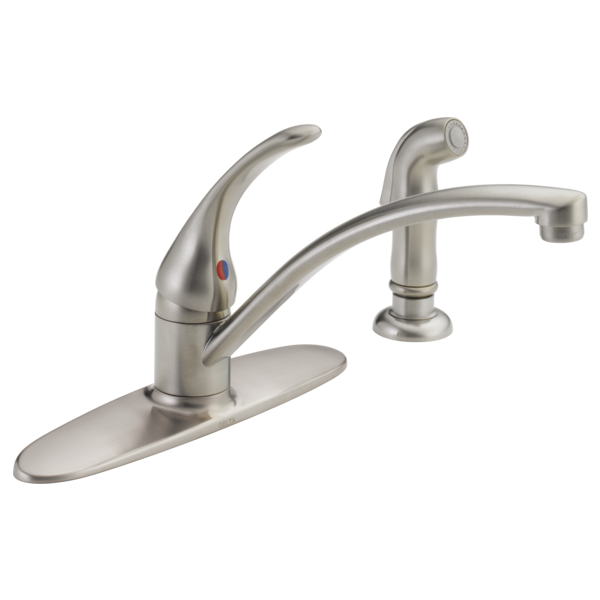 Rated 5 out of 5 by kensplace from works fine and looks good Had the new Delta faucet installed because the previous name brand faucet didn't last quite 5 years. Rated 5 out of 5 by Peter from Easy to install Very reasonably priced. It was easy to install. Rated 5 out of 5 by Rusty from Nice and simple We have had Delta products in our house since 1974 with no major problems. Parts are easy to find, unlike the PP faucet in our kitchen. Several plumbers suggested Delta, so we purchased this one for our condo. Rated 5 out of 5 by GeoTom from Easy, smooth operation. I purchased this model Delta to replace a 36 year old Delta Classic 2-Handle Std. Chrome Kitchen Faucet w/side sprayer and plastic knobs. Installation 2-weeks ago following the provided directions was pretty simple. The feature I like is the ease of operation, which only takes a gentle motion with a pinky finger. Also, I like that it can be operated with the back of your hand if your hands are sticky from cooking in the kitchen. The aerator and screen was easy to remove and replace with one that connects to my portable dishwasher and this was convenient. 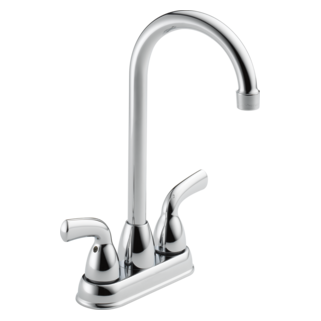 I also really like that this unit is not huge in size like some modern model faucets, and that it is unobtrusive to the eye in the kitchen. It functions nicely and is a beauty. Rated 3 out of 5 by Robert from Nice looking faucet for the price I purchase this faucet at home Depot. Installation was very easy and it looks great on the sink. The only issue is it sometimes makes a banging noise when first turn on almost like there is an air pocket. 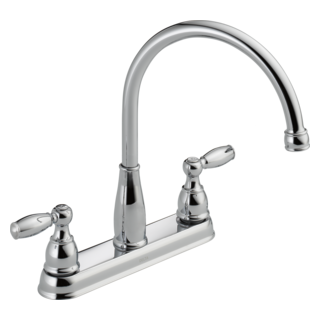 Rated 4 out of 5 by robm99x from Delta kitchen faucet B4410LF-SS w/A plastic clip This is my second Delta kitchen faucet B4410LF-SS for the same kitchen sink I've purchased and installed myself (I am not a plumber). The previous unit's hand sprayer had been leaking all over the place and caused some water damage under the sink. While I like the brushed metal look and the overall quality is quite good, I feel Murphy's Law has bit me and a few worn out washers caused the handle to leak. I had to pay another $80 because I don't have my old receipt and I don't know exactly how old is my previous faucet. Anyways, installation is very simple and its done and not leaking any more. Just aggravated that the sprayer handle leaked all over the place. I would love to give 5 stars but for a leaky handle after just a few years is not really acceptable. How long is the side sprayer hose? How long is the side sprayer hose? I want to compare it with the one I currently have before I decide to buy this faucet. I measured my faucet just now. From the sink to the tip of the sprayer is 40 inches. Is a Stainless Steel replacement handle available? I have a B4410LF-SS Kitchen Faucet. I need to replace the handle but the only replacement part I can find (RP44476) appears to only available in Chrome finish. Can I get RP44476 in Stainless Steel finish? Since the copper supply lines spin, I am having trouble tightening the bolt to the supply line. What can I do? A picture would be helpful, but I will try to answer your question based on what I think you are trying to do. Twisting/spinning the copper supply lines is going to result in damage to your pipes and a leak. You need two crescent, or two open end wrenches, one to hold the copper pipe from twisting, and a second to tighten the supply line hose. Don't make it too tight or too loose. I would guess about 10 foot lbs. I would use some teflon tape or Rectorseal Tplus2 on the threaded connections to ensure a watertight fit, which you can get at your local hardware store. is there a delta adapter to accomodate whirlpool portable dishwasher? I have a W10254672 Whirlpool Washer Adapter but it will not work, as it is too short for coupling. If you check Delta's web site, you can ONLY buy the entire spray hose set. Can I install a B4410LF on two holes? I bought this faucet thinking it will allow me to install it on a two hole counter-top I have. Is there any way I can remove the cover plate so I can use one hole for the faucet itself and the other for the spray? Why did the hot water pressure drop as soon as I installed this faucet? Does it have some kind of water saving feature that is impeding the water flow? Thank you for your question, Larry. I am sorry to hear you are experiencing a problem with your faucet. It sounds like the water pressure drop could be caused by a debris in the supply lines or faucet. During installation it is always key to flush the faucet and supply lines to prevent debris from becoming lodged in the faucet. On this post I have attached a link of a how-to-video that will explain how to flush the lines. 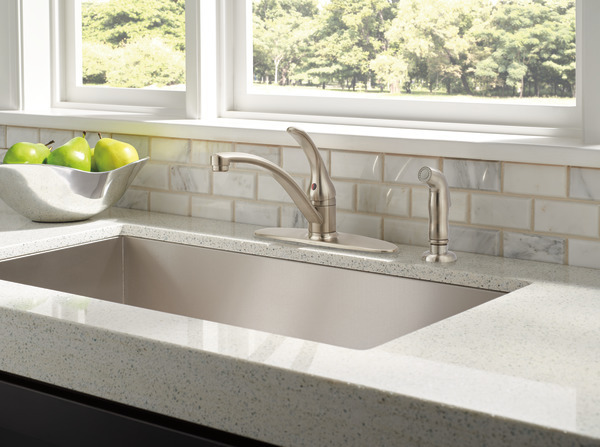 Learn how to flush the lines of your kitchen faucet. This video is generalized for faucets and showers. Your specific faucet may not be covered or featured and could be different. If you have any questions please call 1.800.345.DELTA our team will be happy to walk you through this process and provide any assistance you may need to resolve the issue.